Edit: August 21 2017 - Follow my Rev Kite learning journey (from day zero to present) in this thread!! Join me, share the failures and achievements, feel free to chime in if you read something you experienced too! I'm brand spanking new hoping to make some awesome new kite friends in the San Francisco Bay area..I'm in Santa Clara and frequent the Kite Lot in Mountain view by Google, flying RC stuff secretly. Ive done research and know there's a Bay Area kite sport league or something, and big kite groups up in Berkeley. That's just too far for my tight schedule. So hoping to meet some folks around closer here that will be willing to "take me under their wing" (or kite). 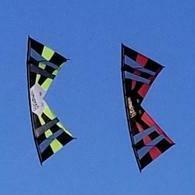 I'm madly interested in the Rev kites. Actually I'm this close to dropping my wallet for the new EXP Rx kite, but at the same time, I really rather just get the Classic 1.5 and spend longer in the learning curve. A mentor and flying friend on the weekends will be awesome, hoping to meet someone really soon whos willing to help guide me to my first purchase. The summer is already here and the winds are insane! Thanks and appreciate all of you.